There is no substitute for experience in rough water. Practice will not make perfect, but it will make swimming in rough water much easier. At its most fundamental level, marathon swimming is a daring personal challenge in which swimmers pit themselves against the elements and experience a wide range of emotions that fluctuates between despair and relief. Open Water Swimming is an essential guide to maneuvering the open-water environment and describes how to prepare logistically, physically, and mentally for open-water swims. 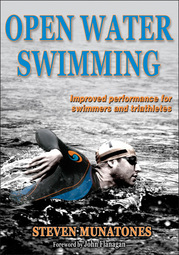 The book includes stroke techniques, racing tactics, and training plans for triathlon, middle-distance, and marathon-distance swims.